The idea is terrifying. The reality? Less so. 3D printed guns seem to be all over the news these days. A federal judge even recently granted an injunction against a guy who, in the past, attempted to publish printing instructions on the internet (in the name of free speech, or something). Now he’s selling the instructions rather than giving them away, and nearly everyone lost their minds about it. But how dangerous are 3D printed guns, really? Namely: How effective are they? How easy are they to make? And most importantly, there’s no way they’re legal, right? We tried to separate the reality from the hysteria with the help of Pete Basiliere, a 3D printing industry expert analyst at Gartner. So what’s the big deal about 3D printed guns? Just the simple fact that people can make their own gun out of basically nothing is, well, scary. There are enough guns in the hands of maniacs/children/maniac children in this country already, and with minimal laws in place to prevent the widespread dissemination of firearms as it is, the idea that now some rando can just start printing them off themselves should concern us. Of course, people have been making their own guns ever since gunpowder was first invented in China. And in modern times, there’s always been a set of hobbyists who enjoy gunsmithing. But it’s still a relatively niche hobby, and what scares people is both the accessibility of 3D printers, and all the gun laws you can circumvent by using them. What laws are actually in place for this? Basically… none? When you make a gun yourself, there’s zero incentive to put a serial number on it to make it traceable, as the law requires with regular guns. And obviously no one is giving themselves a background check before they make one, as the law also requires before purchasing a gun. Add to that the fact that 3D guns can in theory be made out of plastic or some kind of composite, so with the right parts, you could make one that slips right through a metal detector. Eesh. So computer nerds are gonna start their own militias? Well, let’s slow down a bit — there are several reasons why making your own 3D printed gun is unrealistic for most people. 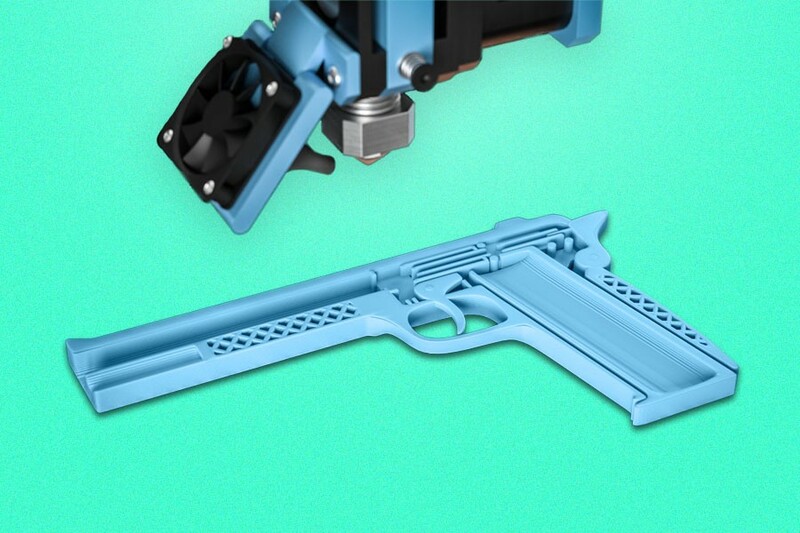 First, a printer that can fabricate a gun strong enough to not explode in your hand costs $10,000 or more. These are business-class machines that very few businesses, let alone individual people, actually own. Even high-end consumer printers that cost a few thousand dollars probably aren’t up to scratch. Plus, if they were, Basiliere says the rough surface quality they would produce would require you to do a lot of finishing afterward to be able to assemble all the pieces. Basically, according to Basiliere, traditional gunsmithing machines far exceed the number of 3D machines capable of making a useable firearm. The prices on those printers will probably go down pretty fast though, right? Not so fast. “There’s some price cutting in the industry, but what I’ve seen more commonly is increased capabilities instead of lower prices,” says Basiliere. Manufacturers are offering better products rather than cheaper prices, as it’s a safer business bet — if they lowered prices they’d have to make up for it in volume, and companies just aren’t going in that direction. Let’s say I wanted to print a gun. How long would it take to make? It could take as long as 24 hours. Far longer, in other words, than just buying a gun off the street or through other illegal means. Here’s the thing, you’re not just printing off a finished, working gun in one go — you have to print multiple pieces that then have to be finished themselves and assembled perfectly. You’re talking many hours to build and cool down for each individual part — you can’t just make one on your way out the door in the morning. Assuming I have access to a good printer, how much knowledge does it take to make a gun? Not much! “The process is analogous to paper printing,” says Basiliere. “If I downloaded a PDF, I just open Acrobat Reader, then hit ‘Print’ and the printer starts printing.” If you get plans for a gun off the internet — which is what that lawsuit is all about — it only takes a bit more knowhow and printing experience, like reorienting the parts so they build more efficiently, or adding support structures (which 3D printing often requires so that the piece doesn’t topple over or deflate like a soufflé while it’s drying). Basiliere points out that high schools and libraries offer 3D printing classes, and universities and the military are training people how to use them, so the number of users is increasing every day. I hear you, but it actually is! Remember that 3D printing machines don’t only fabricate lethal weapons — they’re a far bigger force for good. Every custom hearing aid nowadays is made with 3D printers. Invisalign braces and other devices are made with 3D printers. So are hip implants, face implants for reconstruction and many other quality-of-life or life-saving devices. Even some airplane engine parts are made with 3D printing now. But the guns: How deadly are they? It all depends on how they’re built. Would you trust holding a piece of plastic you built — from plans you got off the freaking internet — that’s about to ignite and send a bullet traveling at the speed of sound? The majority of experts I either talked to or researched said they probably wouldn’t. If you desperately needed to fire that bullet, you’d be better off getting some plumbing pipe and a hammer, prison style, and hoping for the best with a good whack. Or to be on the safe side, just hit the person with the pipe or the hammer. So there’s not much to worry about yet? That’s right. Of course, it’s probably only a matter of time before someone tries to sneak one aboard a plane, the media will freak out and people will start to call for a ban on 3D printers — all while school shootings carried out with dad’s loaded, unlocked arsenal continue unabated. This controversy is great First and Second Amendment grist, and an irresistible media story (people making guns at home as easily as baking a cake). But there’s no real need to lose sleep over it. The short answer is, it can be done in theory, but in reality, it’d be very difficult to pull of. And let’s face it, in this trigger-happy country, there are far cheaper and faster ways to obtain a gun without having to build it yourself.